The end of last week’s “Coral Palms Pt. 2” appeared to throw a wrench in the Nine-Nine’s plans to back up Jake and Holt in their mission against Jimmy “The Butcher” Figgis. That’s a concept that’s pretty much thrown out tension-wise come this week’s “Coral Palms Pt. 3” though, as the crew are already in the process of deliberately disobeying their goober new Captain’s (Ken Marino’s C.J.) orders when the episode checks in on them. There’s clearly no time to focus on the decision-making process of that choice—the crew apparently doesn’t even have time to get ready and packed for the Florida trip anywhere but the Nine-Nine itself. (And keep in mind, they’re already mostly packed before they’ve heard that C.J. still says no to the mission.) If that sounds like it’s stretching credibility a bit—even in a world where Jake’s frosted tips are considered acceptable in 2016—it’s because it and the trip to Florida in general serve as reminders of how Brooklyn Nine-Nine can sometimes have so much material to offer on weekly basis, only to be stifled by the confines of the 30 minute television format. Obviously, “Coral Palms” is already a three-episode arc, but there is just so much more Brooklyn Nine-Nine could and can do with the premise that not everything can fit. So while “Coral Palms Pt. 3” is certainly a suitable and solid conclusion to this arc, there could still be so much more. Especially since Brooklyn Nine-Nine’s picture of Florida continues to be as cartoonish as humanly possible in this episode. However, the barrage of Florida jokes here at least feels truly earned, like the build-up of six months worth of obvious frustration from Jake and Holt’s exile and the Nine-Nine’s helplessness. The episode starts off on a high with its depiction of local Florida news (everything about it is “The Most”) and the continuation of Sheriff Reynolds simple-minded negligence and Tito’s love of meth; in fact, it feels like a tighter version of a Saturday Night Live sketch. And despite the lack of Jorma Taccone in this episode, the spirit of the short-lived Taylor and “Larry” relationship lives on in the case of the former closing down the Fun Zone for the Figgis sting operation. 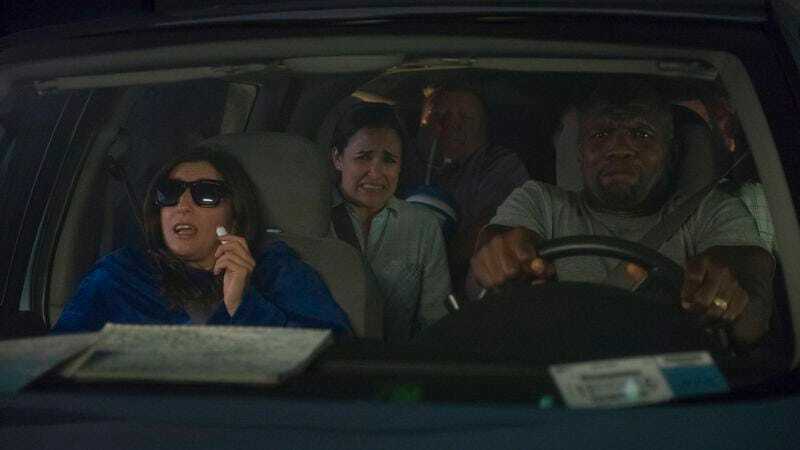 The “Coral Palms” trilogy has been an especially out there return to the world of Brooklyn Nine-Nine, as the Florida location has essentially been Brooklyn Nine-Nine’s license to be extremely weird. But it works, and “Coral Palms Pt. 3” is the peak of the fever dream aspect of the scenario, right down to Eric Roberts’ role as the the infamous Jimmy “The Butcher” Figgis. “Coral Palms Pt. 3” also features what is perhaps the most ridiculous music choice in the history of Brooklyn Nine-Nine: P.O.D.’s “Boom.” It ends up working very well, but its very existence on the show feels like an unintentional joke all by itself. As for normal, non-Florida weirdness, Brooklyn Nine-Nine could have easily made a longer thing out of Jake and Amy’s reunion… And thankfully, it doesn’t. Jake and Amy’s awkwardness around each other throughout this episode is full of funny moments—Amy punching Jake in the throat and Jake bringing up how she’s “a better kisser than Holt” immediately come to mind—but it’s the type of thing that can immediately bring red flags on a television show. First comes separation, then comes changed feelings is typically the way. But Brooklyn Nine-Nine doesn’t do that, instead choosing to keep on with the solid foundation this couple of weirdos has. After all, it simply makes sense that their reunion wouldn’t be perfect, since nothing about this entire “Coral Palms” scenario is perfect. Other than Gina’s ability to get a free gun in any situation, that is. Then there’s the Big Bad aspect of the entire arc. The official introduction of Jimmy “The Butcher” Figgis outside of phone calls and tense conversations is sadly hindered by both the show needing to wrap up this part of the story in this episode and the high expectations built with regards to this character. After building Figgis up so much in these episodes and season three, it is a bit underwhelming to see just how easily he falls for Jake and Holt’s tricks to to lure him in. On the one hand, Eric Roberts is a very good casting choice for such an imposing character, and he’s playing a man who has constantly eluded capture and convinced feds to work for him. On the other, the Figgis we actually get doesn’t quite come across as “imposing,” and while he can easily trick the incompetent Sheriff Reynolds, there’s no sense that he’s any craftier than anyone outside of this world’s version of Florida. Especially not when he’s telling Jake his entire plan, which is supposed to sound impressive but leaves no room for errors (which he is clearly plagued with). He’s then foiled simply by Amy shooting Jake. Brooklyn Nine-Nine built this character up so much that it always ran the risk of an underwhelming introduction. So while Eric Roberts is clearly ready to play, there’s nothing much in the sandbox. Overall, “Coral Palms” has been a solid trilogy and return to Brooklyn Nine-Nine, and now with this upcoming night shift situation, it looks like things still aren’t quite going back to the status quo for the team. It’s a good thing Brooklyn Nine-Nine has shown off its ability to change things up and make them work on more than one occasion. Nine-Nine! This week in webisodes Brooklyn Nine-Nine needs: The Florida news team at Channel 36’s WPQG (“Power News!”) is just begging for the spotlight. “We’ve got the most high school sports, the most lottery numbers, and the most weather in the tri-swamp area.” I hope I didn’t just spoil a developing spin-off idea, Dan Goor. Sheriff Reynolds: “Well they started kissing, which I’m fine with. Really, I am. Kiss whoever you want. Except they were both men. Sheriff Reynolds was terrible to the end, but his confusion here about two men kissing was an early highlight in the episode. Despite Terry’s frustration and Boyle’s general dad jerk behavior, Boyle was pretty smart to record an “in case I never see him again” video for Nikolaj. That doesn’t explain why Terry decided to say “dead” so many times in his video to his children, but the sweetness is definitely there. Rosa’s child voice was the single most terrifying thing I’ve heard all year. Ken Marino is simply the best, whether he’s watching Terry’s pecs dance or saying the word “yes.” I don’t want him to leave, but he obviously eventually has to. But does he? He really is the anti-Holt, in all the best ways, and there’s a lot of value in that.